The Dryer Vent - How It Works and Why It Must Be Clean! Appliances like clothes dryers were designed to make our lives easier and handling those unwelcome laundry chores more convenient. They are not foolproof inventions that can be ignored, as some attention to keep them performing well is necessary. Clothes dryers in particular that don’t need a lot of maintenance do require one important maintenance step – dryer vent cleaning in College Station Texas. Every clothes dryer has a vent from the drum that moves hot air out of the machine when in use to prevent condensation in the drum and keep air moving, which is essential to how this appliance works. When working efficiency decreases, 9 times out of 10 the problem is due to the exhaust vent being blocked. Most machines have a door on the top that hides a pullout screen lint catcher. It slides into place at the opening between the dryer’s drum and the vent itself in order to trap lint and anything other debris that could blow into the vent and eventually cause a blockage. Behind the lint catcher where the drum vents, a flexible hose exits through the back of the dryer and usually continues through a nearby outside wall via a wall or roof vent. This allows the unit to keep air flowing to prevent condensation in the drum that could slow drying and hot air from venting into the building. The importance of dryer vent cleaning in College Station TX is to keep the path of exhausting hot air unimpeded for a number of reasons. As previously mentioned, if there is not enough airflow through the appliance, drying time will lengthen and too much heat will build up as a result. This could damage certain types of clothing and cause a reduction in appliance efficiency as well as an increase in operating costs. The biggest danger when a dryer vent is not kept clear is the risk of a fire; high heat inside the drum can cause lint in the lint catcher to ignite. This is an unsafe situation that can cause extensive property damage or even injury to household members. This is very preventable with just a bit of attention and maintenance. 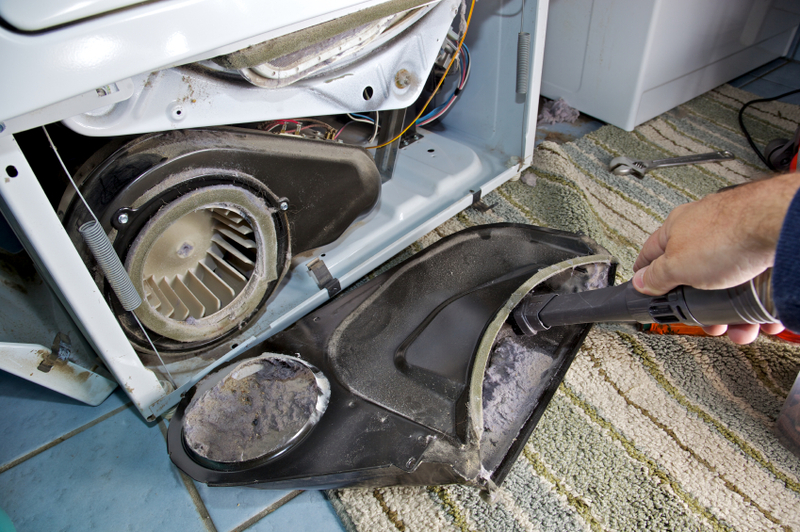 Removal of the lint catcher and exhaust hose followed by cleaning and vacuuming inside the unplugged dryer vent is all that is necessary to prevent vent blockage. Vacuuming inside the hose itself as well as the wall vent with long-nose vacuum attachments is very helpful. If the vent tube is layered with dirt and attached material, replacing it is an easy, safe solution – and cost is minimal. It is also wise to replace any clamping hardware that has become bent or otherwise damaged. The great thing about keeping any dryer functioning efficiently and safely is that it is easy to do. Consumers can easily do dryer vent cleaning in College Station or call an appliance repair service to handle it if necessary. It is vital for safety reasons to be sure that it is done routinely – and kept clean at all times! Need Dryer Vent Cleaning in College Station TX? Call Aggieland Appliance Repair at 979-220-4297 For Dryer Vent Cleaning!